I've called this blog entry "Walking on Samphire" as a pun on the song title "Walking on Sunshine" (geddit?). But it's just occurred to me that I could have had used the geekier title "Walking on Glasswort" as a pun on Iain Banks' "Walking on Glass". Anyway, either would be approximately correct for the delicious saltmarsh-gleaned treat we had for dinner last evening. The name 'Samphire' is used for a variety of quite different plants which grow around the coastline, all of them edible. The one I was picking was actually Common Glasswort Salicornia Europaea but I think 'Samphire' sounds nicer in culinary terms. You certainly don't see 'Common Glasswort' listed on the menus of many fancy seafood restaurants but that, more often than not, is what the punters will be eating when the dish comes with 'Samphire'. I've been keeping my eye on a small patch of samphire in a muddy area of the salt flats but, when we were down there at the weekend, my wife noticed that there's actually a huge amount of it down there hidden among the grass. It's just that it was only easy to spot in the muddy areas. I had bought a large piece of skin-on haddock from our now-faithful fish man and was about to start cooking it when I remembered the samphire. A pleasant five-minute stroll down to the shore brought me back to glasswort El Dorado, equipped with sharp scissors and even-sharper appetite. I gathered a decent bunch, trying to avoid the woodier-stemmed plants. I think it was just past it's best - picking it a few weeks earlier might have meant that the woody stems would not have developed yet. My wife prepped the samphire by cutting off the stems and washing off the mud. I then steamed it with some butter and seasoning. The cooking took out the bulk of the saltiness, leaving the flavour delicate, if still quite salty, and a little asparagus-like. 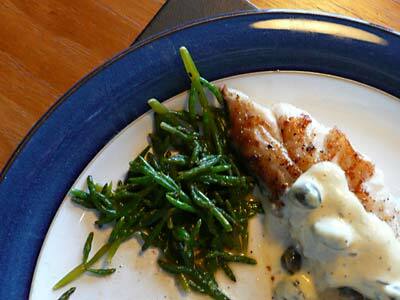 I pan-fried the haddock and made a simple cream, caper and butter sauce to go along with it.